The newly launched Megamos Xtreme from Keyline is available at Tradelocks! Want to increase your car key cloning business by 20 - 30%? The brand new update from Keyline will mean that for the first time ever, it will be possible to clone ALL Megamos Crypto Transponder keys using just one product. The Xtreme will do more than just update your Keyline cloning machine; it will update your services! A security hole that could allow attackers to access users' personal data was inadvertently placed on Dell computers, the company has admitted. The hole represented a "profound security flaw" that could allow access to bank details and other personal data, experts said. Dell has issued guidance on removing the software that produced it. Pro-Vision Distribution Limited, the national distributor of branded CCTV and Access Control, have cemented their relationship with Dedicated Micros (part of AD Group) by supporting their new range of innovative products. Technology firm NCC Group is making its mark in the Netherlands after agreeing to a £93.5m deal to acquire high-end cyber security firm Fox IT. The Manchester-headquartered firm will raise a gross total of £126.3m through a firm placing of new shares and through the placing and open offer of shares at an issue price of 275p. Fox and its subsidiaries is headquartered in Delft, the Netherlands. Brand new Genuine Lishi car opening tools now in stock! There is only one Lishi - Genuine Lishi; the best vehicle opening brand in the world has done it again, with even more auto locksmith tools now available from Tradelocks. Combines keypad and smart card access with the ability to set access codes from a remote location and manage through NFC-enabled tablet. An 18-year-old mother is accused of taping up her toddler with packing tape and leaving him in a car for hours. Tradelocks introduce the solution to creating VAG Vehicle car keys in ALL key lost situations. As all auto locksmiths know, it can be time consuming and challenging to create keys for VAG vehicles when the original keys have been lost or no longer work. While many businesses are flat out with pre-Christmas sales, here at Locksmiths Exhibition we enjoy a brief lull. This is the time many think of family and friends over the holiday while we are ramping up with the pre-show arrangements. 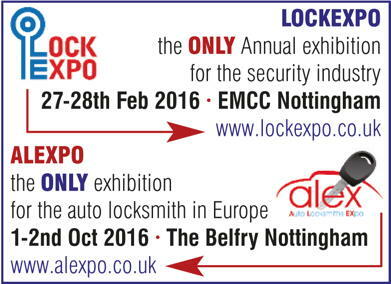 For 2016 the annual Lockexpo at The EMCC, Nottingham University is on the 27th and 28th February - a week earlier because of 'Mothers Day' on the 6th March so don't forget! The automotive industry will experience more change in the next five years than in the last fifty years. At the forefront of this technological revolution is the rise of connectivity and autonomous technologies. As the industry races to connect more vehicles with drivers and their surroundings, the risk of cyber-attacks continues to rise. He who buys wins! Upgrade your Ultegra 884 and Keyline Minis NOW! Want to be the first in the industry to get your hands on the new upgrade? Order now from Tradelocks and receive your Megamos Xtreme by courier the next day! 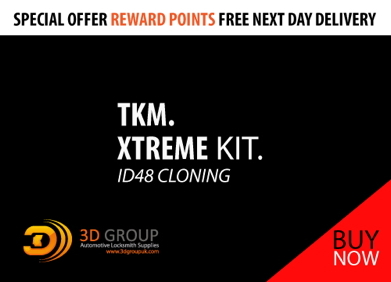 Buy the TKM - Xtreme package today and add full ID48 car key cloning to your services tomorrow! Tradelocks are offering something their competitors are not - the opportunity to start enjoying the profits of having a FULL ID48 cloning service instantly, even over the Christmas period. Siding with Google, a federal appellate court has refused to revive a lawsuit by a locksmith owner who blamed the search company for a decline in his business. Baldino's Lock & Key Service, a locksmith based in Lorton, Virginia, argued that Google wrongly displayed listings for hundreds of unlicensed locksmiths, in order to collect ad revenue from them. The locksmith sued Google in 2014, alleging that the search company violated racketeering laws as well as false advertising laws by "publishing the names of illegally operating locksmiths." Traka, the key and asset management manufacturer, has published a whitepaper, discussing how key management can improve security and health and safety processes within the healthcare industry. The discussion paper, authored by Tom Smith, Solutions Specialist in healthcare for Traka, recognises the security and health and safety challenges the industry faces. In particular, the report highlights how the infrastructure, age and specification of the NHS Estate can make it difficult to provide flexible, but secure and safe access to sensitive areas of a facility, as well as providing access to equipment, vehicles and even medication. When Salford City Council began upgrading its public space CCTV cameras with Hikvision's Darkfighter models, video operatives reported some unusual results: they were suddenly able to see crystal clear night time images. The UK's leading vacant property and security specialist, VPS, has capped a spectacular year by winning "Large Security Installer 2015" at the prestigious IFSEC Security and Fire Excellence Awards. Guardian24 has won 'Best Deployment of Lone Worker Technology' at the Security & Fire Excellence Awards 2015 held at Hilton's flagship Park Lane Hotel, London. The award recognises the outstanding contribution to lone worker protection as deployed by one of Guardian24's key clients, Macmillan Cancer Support. Just days after the Islamic State attacks in Paris, Sunday Mirror investigators sailed through unmanned gates and close to a fuel truck. Photo shows a Sunday Mirror reporter stands unchallenged yards from a passenger plane in a shocking lapse in security at Britain's second largest airport. Guards in 4x4s supposedly patrolling inside and outside airport borders drove by without showing any interest. IDF Aluminium has installed transom closers, hook locks and armoured keeps from Alpro at a new-build Asda store in Wealdstone, north London. For the building frontage, IDF Aluminium fabricated powered pedestrian sliding doors using Alpro deadlocks. These units are available in hook and bar versions and are used widely on sliding and swing aluminium door applications in the retail and leisure sectors. MOBOTIX AG, a leading manufacturer of digital high-resolution, network-based video security systems has released details of a project for London Underground (LU) using innovative thermal imaging technology to protect a service depot. Mitie, the facilities management company, has been awarded a security contract with E.ON, one of the world's largest electric utility service providers. The Frank Barnes School for Deaf Children in Kings Cross, London, has installed a two-way IP audio-video intercom designed and manufactured by Castel.